*Majority of achronim accept the Maharil. Taz 289:3, Maharam Shik 287, Maharsham 1:71 and 3:154, Chelkat Yakov YD 162, Yeshuot Malko (Mezuzah 6:1), Igrot Moshe YD 1:181, Or Letzion YD 1:14, and Yabia Omer YD 4:23:6 agree with Maharil in this case. Binyan Tzion (cited by Chelkat Yakov) and Chazon Ish YD 168:5 agree with Bet Meir. 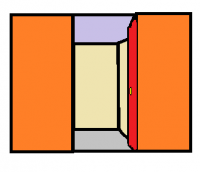 ##If a closet is exempt from mezuzah should it have a mezuzah going from the exempt area into the room since it is like an entrance to the room? 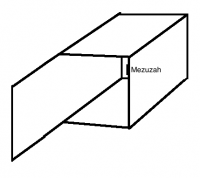 Most Ashkenazim hold that a mezuzah is placed on the left side going into an area that is exempt, while Sephardim hold that the mezuzah is placed on the right side. <ref>Rabbi Akiva Eiger 286:13 writes that since the area is exempt from a mezuzah it can still be considered an entrance into the room. The Chazon Ish YD 168:5 agrees and adds that accordingly the mezuzah should be placed on the left side going from the exempt area into the room. Rav Shlomo Zalman (cited by Hamezuzah Vehilchoteha ch. 3 fnt. 19), [http://www.yutorah.org/sidebar/lecture.cfm/788640/rabbi-hershel-schachter/the-laws-of-mezuzah/ Rav Hershel Schachter in “The Laws of Mezuzah” (min 34-42)], and Binyan Tzion 99 agree. ##If a closet is exempt from mezuzah should it have a mezuzah going from the exempt area into the room since it is like an entrance to the room? Most Ashkenazim hold that a mezuzah is placed on the left side going into an area that is exempt, while Sephardim hold that the mezuzah is placed on the right side. <ref>Rabbi Akiva Eiger 286:13 writes that since the area is exempt from a mezuzah it can still be considered an entrance into the room. 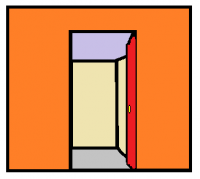 The Chazon Ish YD 168:5 agrees and adds that accordingly the mezuzah should be placed on the left side going from the exempt area into the room. Rav Shlomo Zalman (cited by Hamezuzah Vehilchoteha ch. 3 fnt. 19), [http://www.yutorah.org/sidebar/lecture.cfm/788640/rabbi-hershel-schachter/the-laws-of-mezuzah/ Rav Hershel Schachter in “The Laws of Mezuzah” (min 34-42)], Binyan Tzion 99, and Rav Heinemann (Star-K Kashrut Kurrents Winter 5779 p. 2) agree.